We all love to listen to music, watch videos online. While streaming is a great option, but with most of the content locked down under subscription service, it doesn’t seem to be easy to get what you want. Today, we are talking about Audials One. It’s a software that can record high-quality recordings of audio and video streams. The best part is that its a legal recorder. Note: Audials software is only to be used to record streams and convert files complying with the US and international copyright laws. You must check with laws in your country if you are allowed to re-record. Though it’s highly recommended to only use it for personal use. The app can record from more than 100,000 Internet radio stations in popular media formats which include (MP3, AAC, WMA, etc. You can also listen to each of these stations by finding your favorite or find your favorite artists, band or genre by searching. As you use it, it will kickstart its automatic music suggestions that match your personal taste. You can also find location-based stations by countries, regions, cities or local radio stations. It can also record music streaming from Spotify. It also supports Podcasts and Music TV. The service behind Audials delivers latest music charts for every genre including music videos, soundtracks, hist, and playlist. When it comes to streaming to videos, it can record video clips in high quality from video streaming from Amazon & Netflix. It has a way to bypass unprotected and protected media from the Internet, and save it on your PC. If you love Series, it can download the entire seasons then save each episode individually. If you can get used to the interface, you can use this as a Media Center. You can enjoy music, and stream or download a movie anytime you want. 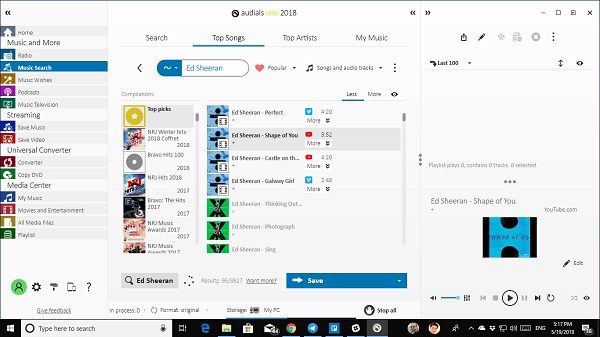 Audials Music Zoom: This is one feature worth talking about. 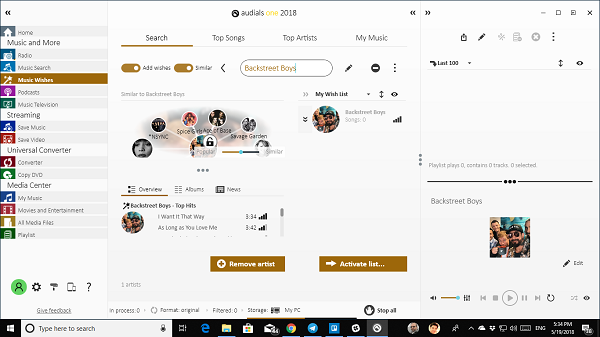 Audials has a music zoom feature which is based on AI. It creates an in-depth, infinite map of the stars, organized according to musical genres. You can zoom in and discover more. All you need to do is search for music, and it will instantly zoom you in towards your artists on this galaxy like looking map. You can discover similar music and artists in the surrounding area. Depending on how popular an artist it, they will appear earlier and larger compared to others. You can use a mouse, and the wheels to zoom in. Once you have downloaded it from its homepage, you will see that the software offers so many features and includes a converter that we just talked about. Putting so many things in one place has resulted in a very complex interface which will take some time for anybody to get used to it. However, the recent update has improved it a lot. 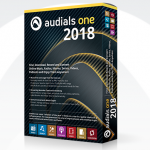 You now get a central search for everything, their central engine, Audials Generation 2018, will deliver new Audials charts, and send out a newsletter for the same. Then you have the Music Wishes. You can add the list of songs you want to listen, and save, and the engine will keep track of through its thousands of radio stations, and services. This is my favorite for two reasons. First, it is very fast at searching, and the results for your wishlist is almost instantly. Secondly, similar searches help you discover more about your choice. Now, when it comes to recording music, you need to know few things. First, is you can record, and cut songs, and secondly, you can always choose best bit rate as they are upfront on the streaming channels. You can also choose to record the whole station or set up X number of tracks to record. Podcasters are going to love it. 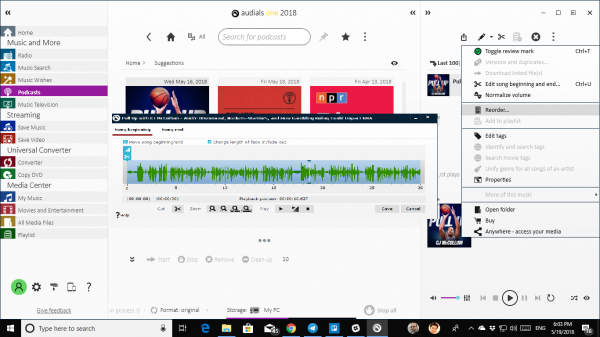 The software allows you to subscribe to your favorite podcasts, edit existing recording, normalize volume, edit tags, properties and so on. So if you ever copy them to any of your devices, it will have proper information available instead of gibberish data. 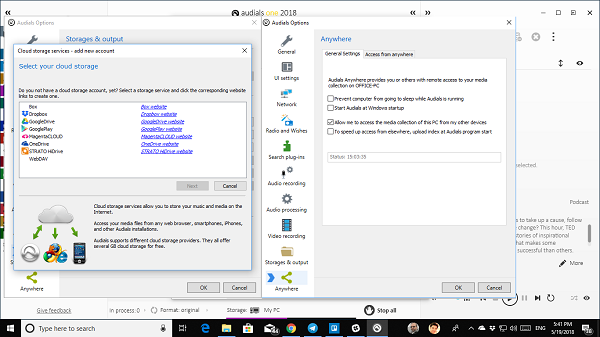 It comes with an audio editor which lets you remove all extra part of the file, and offers tools which are close to what audacity has to offer. When it comes to settings, you will get an amazing feeling. As if like the guys have thought of everything from a consumer perspective. Right from themes to the network to managing of music services to customized audio recording to ID3 Tags to output preferences and what not. I will strongly suggest you take a look at those settings and configure it. Last but not the least, the software offers Cloud Storage integration to Anywhere Access. Lastly, the software has been optimized for Windows 10 look and feel. 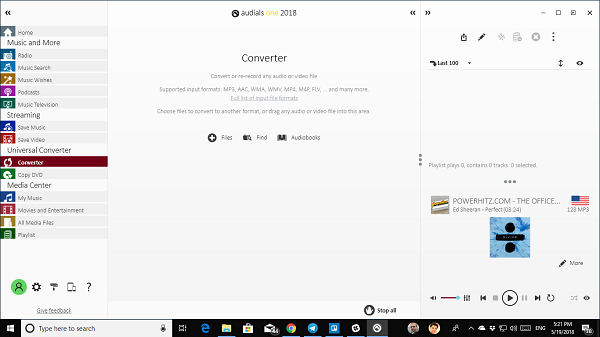 It offers Windows 10 Fluent Design along with multiple dark and light themes. The performance wasn’t an issue during my usage, and even though it can work in the background recording movies back to back, the impact was minimal. After using it for a couple of days, I can confidently recommend this software. Its worth its money, and you don’t have to look at any other service or software to find music, and videos online. You can buy it from its official homepage here.